Researchers from Clemson's Nanomaterials Institute (CNI) have made progress towards their goal to produce wireless power using triboelectricity - a green energy source invented by the CNI In March 2017. The simple triboelectric nanogenerator, or U-TENG, is a small device made simply of plastic and tape that generates electricity from motion and vibrations. When the two materials are brought together - through clapping your hands or tapping your feet, for example - a voltage is generated that is detected by a wired, external circuit. Electrical energy, by way of the circuit, is then stored in a capacitor or a battery until it's needed. Later advancements caused the researchers to uncover a wireless version of TENG, called the W-TENG, which greatly expands the applications of the technology. The W-TENG was engineered under the same premise as the U-TENG, using materials that are so opposite in affinity for electrons that they generate a voltage when brought in contact with each other. In the W-TENG, plastic was swapped for a multipart fiber made of graphene and a biodegradable polymer known as poly-lactic acid (PLA). PLA, on its own, is great for separating positive and negative charges, but not so great at conducting electricity - which is why the researchers paired it with graphene. Kapton tape, the electron-grabbing material of the U-TENG - was replaced with Teflon, a compound known for coating nonstick cooking pans. "We use Teflon because it has a lot of fluorine groups that are highly electronegative, whereas the graphene-PLA is highly electropositive. That's a good way to juxtapose and create high voltages," said an author of the study and an assistant professor of physics at Clemson. 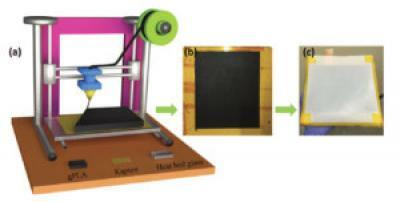 After assembling the graphene-PLA fiber, the researchers exploited additive manufacturing - otherwise known as 3D printing - to pull the fiber into a 3D printer, and the W-TENG was created. The end result is a device that generates a maximum voltage of 3000 volts - enough to power 25 standard electrical outlets, or on a larger scale, smart-tinted windows or a liquid crystal display (LCD) monitor. Because the voltage is so high, the W-TENG generates an electric field around itself that can be sensed wirelessly. Its electrical energy, too, can be stored wirelessly in capacitors and batteries. "It cannot only give you energy, but you can use the electric field also as an actuated remote. For example, you can tap the W-TENG and use its electric field as a 'button' to open your garage door, or you could activate a security system - all without a battery, passively and wirelessly," said first author of the study and a Ph.D. student in physics and astronomy. The team of researchers is in the process of patenting the W-TENG through the Clemson University Research Foundation. The director of the Clemson Nanomaterials Institute, is also in talks with industrial partners to begin integrating the W-TENG into energy applications. However, before industrial production, the team says more research is being done to replace Teflon with a more environmentally friendly, electronegative material. A contender for the redesign is MXene, a two-dimensional inorganic compound that has the conductivity of a transition metal and the water-loving nature of alcohols like propanol.